One sentence: lovin' the Atlanta highs of mid-60s! And PS - picked up these new heels for less than $40 when Extra Petite Jean shared the Talbot's code last week. Lastly, did you check out my blog giveaway? It ends on Friday! the pumps are very beautiful and of course your dress too! What a unique dress I love it! 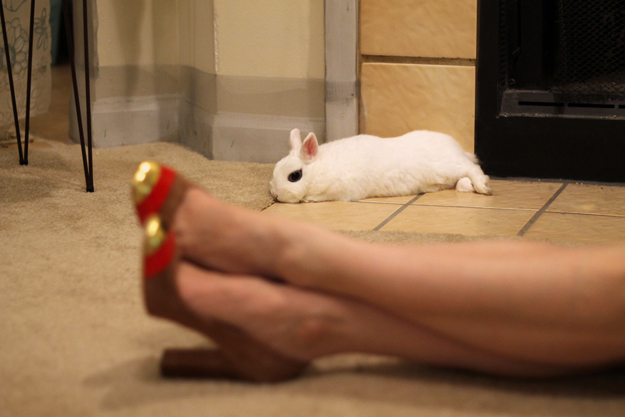 And that picture of your bunny and the shoes, adorable! loving the dress...there's nothing like finding a great thrifted piece like that! Lovely dress and those heels are fab!! Beautiful dress and those heels couldn't be anymore perfect with it. Love the shoes! Never would have thought they were from Talbots! Do they fit true to size? Rachel - I've found this pair to fit to true size. I've read that their sizing can be inconsistent. Great overall look...I love the dress and shoes!! WHAT? Those shoes are from Talbots??? OK I need to look at their site again, it's been ages since I've set foot in one since our flagship store in Chicago closed! The pattern on your dress is beautiful too! Dramatic statement piece! I like how you can transition it from day to night! As you know, I love thrift finds. I'm loving the print of your dress. And I've been lemming that purse of yours. amazing dress, looks great!! and the bunny is SOOO cute !! 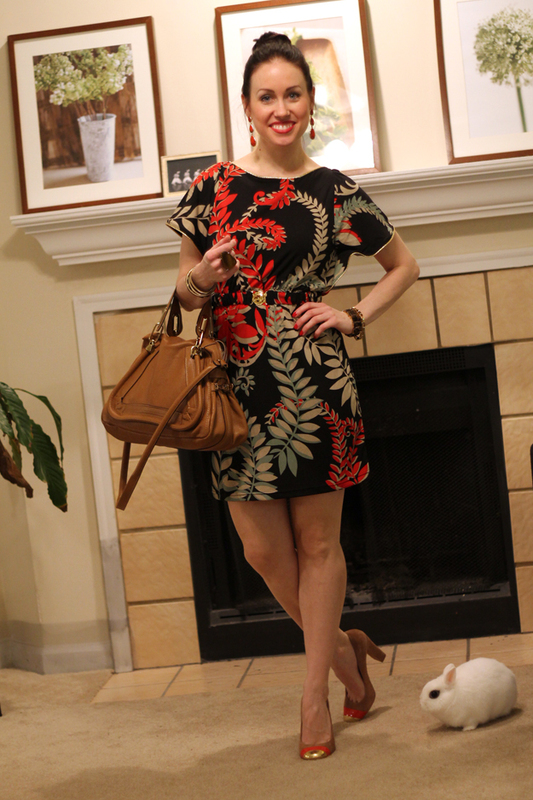 Love the dress print and gorgeous shoes! Love those cap toed heels!! Awesome color combo! Would love it if you could stop by my blog and tell me what you think of my latest posts! Follow me, I follow you?! I don't know if u could find better shoes to match this lovely dress! :) I really love your look dear!! The dress is too cute and I love the fit and print on you! The Paraty is such a nice, classic bag too! I think you've found the best thrift store dress ever! It's absolutely gorgeous on you! Love the new bag, major score! Also I'm seriously digging the pumps, I love a good cap toe detail. such a snazzy look!! love love the gold toed heels...and the bunny of course;) so happy to have stumbled upon another local GA blogger, i'm in athens! this unseasonably warm january weather is welcome here! Love the dress, love the shoes! I need to see if they have those in my size. Mary Ann I've noticed you've been doing your brows more naturally! You look so beautiful! The natural look works so well for you, sometimes more is less, you know? @Anon Um, I haven't done anything different. Lol?